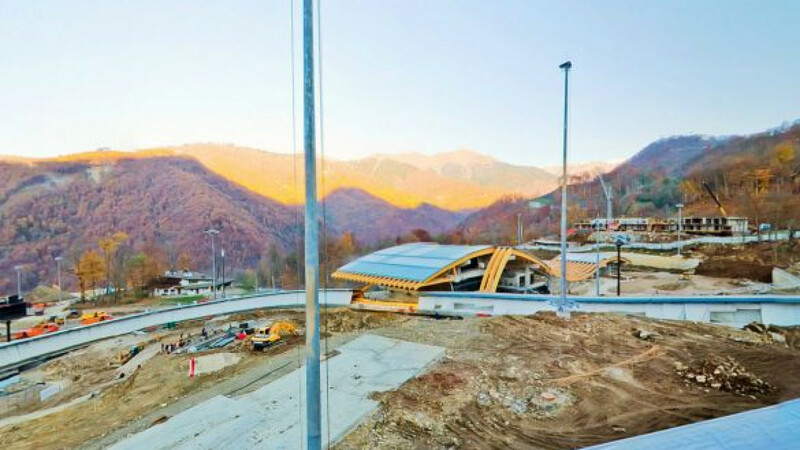 The Sanki Sliding Center at Rzhanaya Polyana, in the mountains above Sochi, pictured while under construction. Bobsled and skeleton athletes from the U.S and other nations are upset over ice conditions at the track that will be used for the Sochi Olympics, saying they're impairing their ability to get ready for this weekend's World Cup finale and prepare for the 2014 Games. The issue is not about speed, safety or design — everyone's satisfied with those elements — but rather how the ice is being maintained. Many sliders are alleging that when they have access to the track, the ice is not being tended to properly, which has led to some bumpy rides down the chute. Some U.S. sliders have been in Russia for more than a week, with only 10 trips down the track to show for that time. Sliders have said that international ice time has been canceled twice this week already but that the Russian teams have been permitted to train as scheduled, which many are calling a display of pre-Olympics gamesmanship. "It's so bumpy out there," U.S. skeleton athlete Noelle Pikus-Pace said in a telephone interview from Rzhanaya Polyana, where the track was built about an hour northeast of Sochi, the Olympic hub. "There's actual concrete in the outrun. It just isn't ready for us to slide. The track is a mess." It's not just the Americans who are upset. Olympic skeleton silver medalist and newly crowned world champion Shelley Rudman of Britain said "poor ice maintenance" led to two days of canceled workouts, and Canadian slider Eric Neilson turned to Twitter to express his frustration. "This trip here has turned into a joke really," Neilson wrote. "Where are the hidden cameras?" Bobsled and skeleton's governing body, the FIBT, has no plans to cancel this weekend's World Cup event, though many sliders have asked in recent days if it's even a smart move to consider competing. Some have complained of blurred vision during runs from bouncing around on choppy ice, and others have experienced headaches after going down the track. "It's pretty frustrating coming to the track every day with a track crew that does not know what they're doing," U.S. skeleton athlete John Daly said. "No work is being done on the track. There's delays in every session." A representative of the Sochi 2014 Organizing Committee did not respond to a request for comment by press time Tuesday. Pierre Lueders, the longtime Canadian bobsled driver who now coaches the Russian team, did not return an e-mail seeking comment. The team from the host country gets a home-ice advantage in every Olympics. At the track in Whistler, British Columbia, for the 2010 Olympics, Canadian sliders — as was their right — got dozens more practice runs down the world's most treacherous course than any international competitors did. And when the U.S. has hosted bobsled, skeleton and luge world championship races in recent years, Americans have enjoyed quite a medal haul as well. The better a slider knows a course, the faster they get down the course. What's further irking the international sliders in this case was the scene that played out earlier this training week, when foreign teams were not allowed to train because of the poor ice conditions. But those problems were fixed in time for the Russians to get their daily practice sessions in that night, and allegedly without any international eyes allowed to watch those proceedings. "The longer it goes, the more you wonder what's going on," said U.S. Bobsled and Skeleton Federation CEO Darrin Steele. "At this stage in the game, it's hard to understand why they wouldn't have a good handle on the track maintenance and why the conditions aren't good. This is official training for this World Cup, and we typically don't see these types of problems." Steele said his coaches are "very frustrated with where things are." Another frustration source for non-Russian teams is that next season's pre-Olympic training week at the Sanki Sliding Center is scheduled to end about a week before the start of the World Cup season in North America, which could lead to some logistical issues. The Russians will not be part of that training week. They're planning to train on tracks in North America that week, though Steele said U.S. and Canadian officials are considering not opening up their facilities to the Russians because of the problems they're experiencing now. U.S. skeleton coach Tuffy Latour said the venue itself is gorgeous, and he is among those raving about its unique design. But the ice condition, he said, takes away from everything. "There isn't a track crew to be seen, and the organizers haven't asked for outside help," Latour said. "We have a world of knowledge at the other international tracks waiting to be called on. It's frustrating to be here with great weather, a fantastic-looking facility and athletes that are eager to slide, yet we sit in our hotel rooms and wait."